 There are two routes: Beppu and Usuki in Oita Prefecture, Kyushu, to Yawatahama in Ehime Prefecture, Shikoku. The accommodation on the boat is simple but comfortable for the 3-hour journey. A private room is available for special occasions. The route beside the Sadamisaki Peninsula and across the Bungo Channel is scenic, and you can see many seabirds and occasionally dolphins. A short ferry trip is a good opportunity to relax and perhaps strike up a conversation with your fellow travellers. The boats all have Wi-Fi too, so you won’t be out of touch. Uwajima Unyu Ferries links the islands of Shikoku and Kyushu, with numerous sailings a day across the beautiful Seto Inland Sea. This service is ideal for independent travellers who want to experience parts of Japan that are off the beaten track. Yawatahama is a picturesque port with an illustrious history as the centre of Japan’s industrial revolution. It has attractive streets of old houses, factories and sake breweries. Japan’s first aeroplane was invented here. Beppu is known as one of Japan’s premiere onsen towns. The whole town steams with vapour from the hot springs. Even if you’re not interested in bathing with strangers, the spa town atmosphere and sights are well worth the visit. Usuki is a castle town with streets of samurai residences that you can visit. Today only the walls of the castle, and some impressive gates and watchtowers remain. The unusual stone Buddhas of Usuki are celebrated as national treasures. You can stay on the ship until 05:00. You can stay on the ship until 05:30. At the time of booking, please tell us if you plan to stay. If you have expressed the intention to stay, you cannot leave with your car until 5:00 am. This service may not be available during peak periods. Pets may not be brought into the passenger rooms. One infant under age 5 accompanied by an adult in second-class accommodation travels free of charge. However, this does not apply to groups. For private use of the special class by a single individual, an additional fee of ¥6,130 is charged on the Beppu route, and ¥4,690 on the Usuki route. The fare includes a second-class passenger fare for a single driver. The passenger fare applies in addition to the motorcycle fare. A booking isn’t required for foot passengers in the standard second-class accommodation. If you have a car or motorcycle, call one of the following numbers to make a reservation.